Like people, cocktails can be organized into families. There are the sours, the champagne cocktails, the duos, the trios….many families. 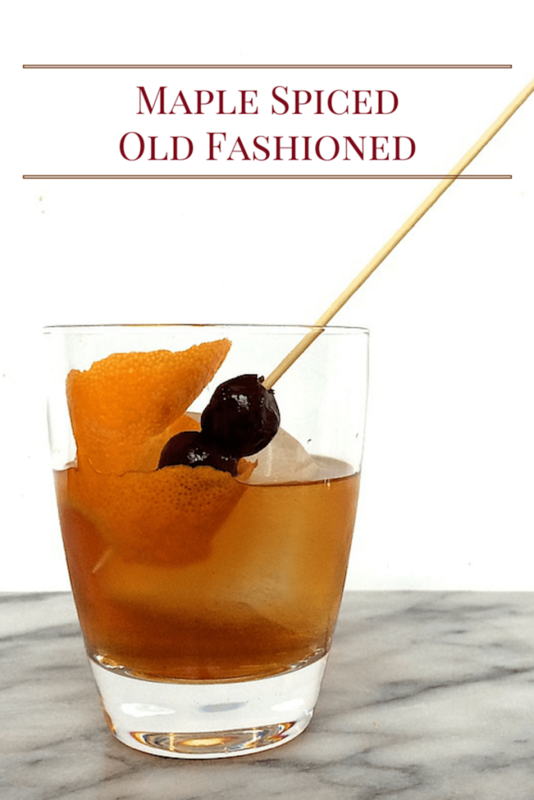 And the great, great, great granddaddy of them all is the Old Fashioned. The first known definition of the word cocktail was in 1806. Back then a cocktail was spirits, bitters, water, and sugar. Nothing more, nothing less. The barmen knew what these retro lovers of simplicity wanted: American whiskey with just enough bitters, water and sweetness to round out the flavor. Thus was the official Old Fashioned Cocktail born. I try to stay true to the spirit (hah! booze pun!) of the Old Fashioned while still allowing for some fun barcraft. This variation is the perfect winter sip to warm you from the inside out. We’re gonna start off, as we so often do, with a flavor-carrying simple syrup. In this case, a delicious maple caramel loaded with the warm flavor of the cookie spices. I am currently in love with allspice as a cocktail flavor component so that gets pride of place here. If you want to go with more cinnamon or add cloves or whatever, feel free. The syrup is simple: simmer, reduce, strain. 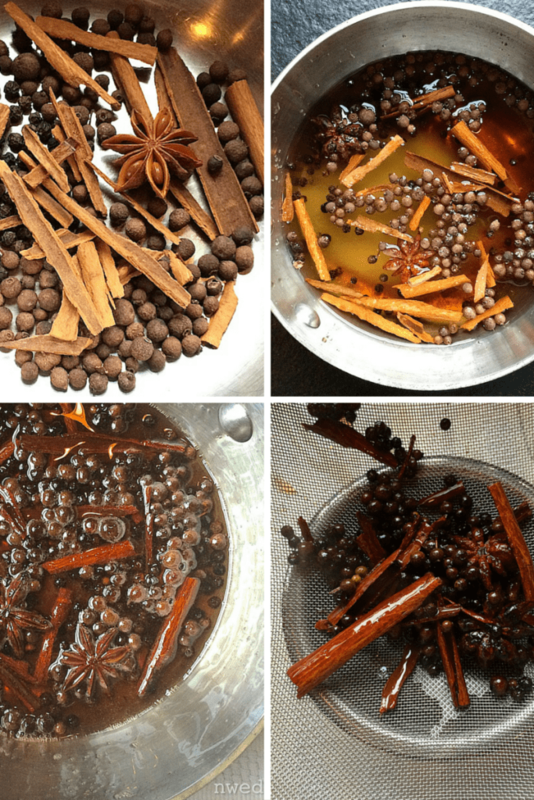 I use a lot of spices because I want a ton of that spice flavor to make it into the syrup and cocktail, but because I strain the syrup while it’s still warm, I’m not allowing for an extended infusing time. If you reduce the syrup too far, you’ll make something that will harden like toffee as it starts to cool. If this happens to you (as it did to me on my first recipe test of this cocktail) just add a bit of boiling water to the syrup and stir until your solid returns to a liquid. You’ll need some rye whiskey or bourbon. Here at the NW Edible Cocktail Development lab (aka my kitchen), we have become big fans of Rittenhouse Bottled-in-Bond 100 Proof Rye Whiskey for whiskey-based cocktails. Rit, as we affectionately call him, is a strong, reliable mixing spirit at a very reasonable price point for the quality. Whenever we see this bottle in stock at a liquor store, we grab 1 or 4. You’ll also need the strained, cooled Maple Spice Simple Syrup and your aromatic bitters of choice. I used Scrappy’s here, which was excellent, but the widely available Angostura bitters is fine. Because we are hipster douchebags when it comes to cocktails, our old fashioned-style drinks get served on “the rock” – a giant single cube of ice that melts very slowly, allowing longer drinking time before a cocktail becomes overly diluted. We make our ice megaliths in an inexpensive silicone ice cube tray. Garnish with a nice big zest of orange peel and a few brandied cherries (or whatever non-horrifying maraschino cherry substitute you prefer). Add the water, maple syrup, sugar and all spices to a very small saucepan. Bring to a simmer. Stirring occasionally, simmer until the liquid has reduced to about 3/4 cup volume. While the syrup is warm, strain the syrup off the spices. You'll have about 1/2 cup of finished syrup. Allow the syrup to cool. The syrup should be thick but still pourable when it cools, like honey or corn syrup. If it has started to solidify like a hard caramel, just add a bit more hot water and rewarm the syrup while stirring to thin it out. 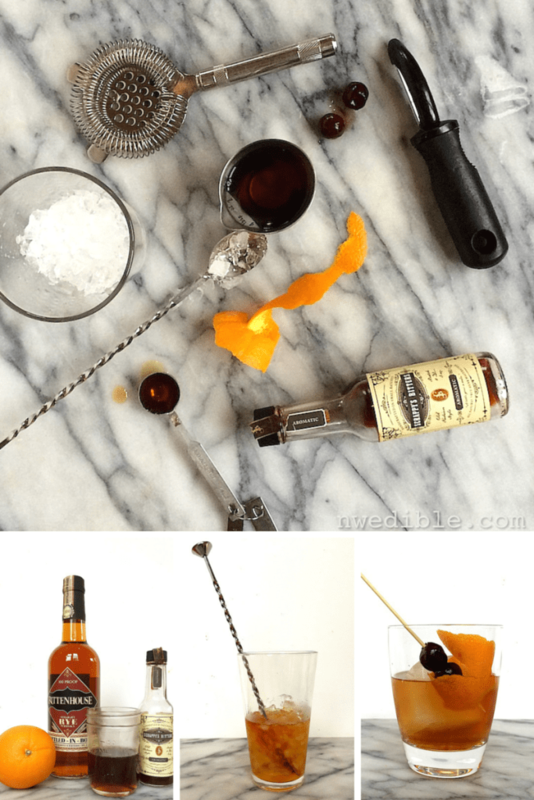 To a shaker filled with crushed ice, add the bourbon, Maple Spiced Simple Syrup, and bitters. Stir well until the drink is nicely chilled, about 20 seconds, then strain the cocktail into an old fashioned glass. Add a jumbo cube of ice, rub the orange zest around the rim of the glass, and garnish the drink with the orange zest and the brandied cherries. nice!!!! that looks absolutely beautiful. great work. i’ll take one a gallon please. Delicious-looking cocktail! Hooray for Friday! Curious as to other uses for the leftover spiced syrup. I can dream some up, but what do you use it on? Would be delicious to sweeten tea, especially something like an apple spice tea. I’d also dribble it over apple or pear desserts. But in a jar in the fridge it will keep more months and months. Looks delicious. I’ll give this a try. Though, when it came by in my RSS feed I thought it said “Maple Old-Spice Cocktail…” Now that is something I would stay away from. So you are only making enough syrup for one cocktail? I were to scale up and make more, would it keep okay? No there’s about 1/2 cup finished syrup at these quantities – that should be enough for 10 or 12 drinks. In the fridge it will keep for months. The hubbins and I have been really getting into whiskey the last year or so. We have 5-7 whiskey in our Arsenal and bought a cute book for xmas to guide us in our preferred whiskey profile. I told him about your drink and he said flatly, ” you like whiskey drinks but you don’t like old fashioneds”. Lol–he was soooo right! I made this and ended up adding 1-2 T of the syrup instead of 1-2 tsp, so I could tolerate it. I’m a whiskey enthusiast who needs sweeteners/water/ice in her whiskey drinks. A favorite of mine: 2 oz whiskey (monkey shoulder), 1.5 oz Cointreau, 1T strained homemade apricot jam, splash of OJ (2 +/- oz)… Yummy. Thanks for the drink though. I’ll work it out I’m sure!!! 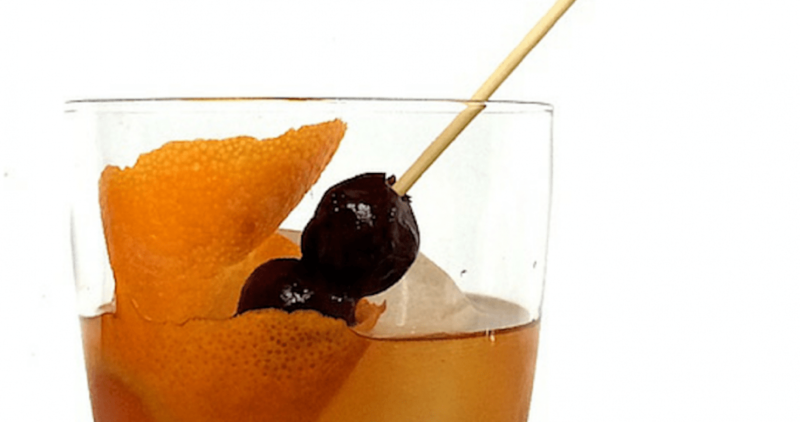 You’ve found a way to make bourbon palatable! Thank you, from the bottom of my heart, for myself and my whiskey-loving husband. This looks like mixology level: Expert, delicious level: Maximum. I’d give it a try. Loved this! Thanks. I made it with both bourbon and cognac (for someone who doesn’t like bourbon). My twist was to add an ounce of arancello (orange limoncello, I got mine from Crescendo in Eugene).